Welcome to Day three of the challenge. If you missed the first two days you can see Day 1 here or Day 2 here. NOTE: In my last post a question was asked what did I mean by left facing and right facing pages, basically this a printing term used for a book or publication, it just indicates that these two pages would go side by. This is termed as a spread see here for definition. Today I thought I would spice it up and do something different. I love things that can be removed or things that allow you to add things too. So for this one I created a pocket again very simple and a tag that can be removed. The tag tucks into the pocket and until you remove it you don’t see the pretty flowers at the bottom. Sort of like a wonderful surprise. For the right side I did something very simple, for this one you can either add a picture or journal or both. What every you want. Take Old Olive 4 w x 6 h (tag) and using the corner rounder punch three corners leaving the bottom right alone. Take the Whisper White 3.5 w x 5.5 h (tag) and do the same as above. Using the flower stamp, stamp three flowers using Rich Razzleberry, Melon Mambo, and Crushed Curry let dry. Using the blender pens remembering to work from the inside out – dark to light to give each flower shape and form. Stamp at the top (remember that you will be punching a slot at the top to add the ribbon so make sure you don’t stamp to high) using one of the stamps from Warm Words using Old Olive Classic Ink. 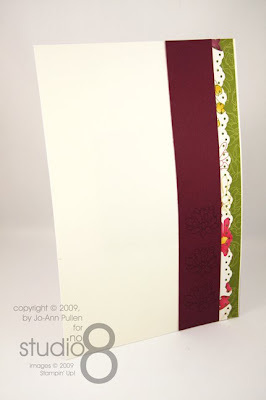 Assemble both pieces and using the horizontal slot punch through both pieces of card stock and add ribbon. 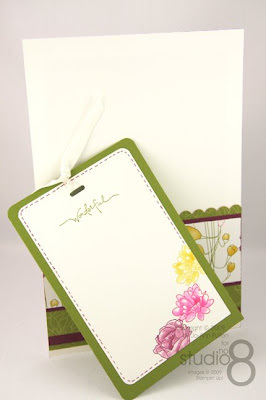 Take DSP Lovely Flowers 6 w x 4 h (green flowers) and punch one of the wide sides using the scalloped edge punch. Add to Whisper White (all pages) 6 w x 9 h leaving approx .25” of whisper white at the bottom. Adhere the DSP Lovely Flowers 2 x 6 (flowers) to the Rich Razzleberry 6 w x 2.25 h.
Assemble the last two pieces as per picture. Take Rich Razzleberry 1.5 w x 9 h and using one of the flowers stamps and Rich Razzleberry Classic Ink stamp three flowers at the bottom. 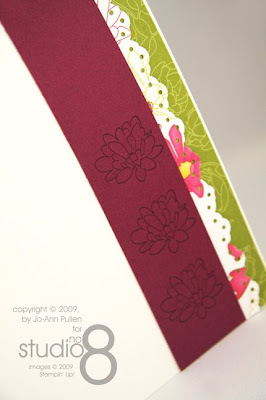 Take the DSP Lovely Flowers 2 w x 9 h (flowers) and using the Eyelet Boarder Punch, punch along one of the longest side. 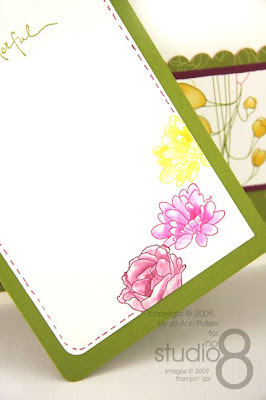 Adhere the DSP Lovely Flowers 2.5 w x 9 h (green flowers) to the Whisper White (all pages) 6 w x 9 h.